When it comes to patio coverings for your home, we know you have many companies to choose from. But the more you get to know us and our products, the more reasons you’ll have to choose Lumon for your patio coverings for the benefits and style it brings. On the surface, patio coverings look simple to design and manufacture. Consequently, it’s not unusual for new manufacturers and re-sellers to appear with new products—but then disappear just as quickly. At Lumon, we’ve been creating patio coverings and related products, such as retractable glass walls and glass balcony rails, for over 35 years. Our products have been thoroughly tested and proven, and we stand by behind them with a generous warranty. Every home, backyard and patio is different—as is every homeowner’s needs and preferences. Which is why any “pick option A, B or C” solution is going to disappoint. We recognize that there is no one-size-fits-all solution when it comes to patio coverings. Therefore, we design and engineer every installation to work specifically for you and your home. While our company was founded in Finland, we’ve since expanded around the globe. Today, we proudly manufacture our patio coverings for Canadian customers at our Ontario manufacturing facilities. In addition, we have showrooms in Langley, BC, Vaughan, ON, and Hamilton, ON and authorized dealers across Canada. Sustainable development and respect for nature are essential to Lumon. Our materials are recyclable and all production material remnants are recycled to produce new products. We just wanted to tell you how happy we are with our new Lumon patio covering. We appreciated your prompt visit to our home to provide us with a professional consultation and review the product and options. Darryl and the other installer worked hard to install our awning during not so favourable weather. They did a fantastic job and the cleanup was spotless. Darryl also went through a checklist with us and explained everything prior to leaving. Thanks!! Designed to offer a comforting and essential protection from Canada's inclement weather and harmful UV rays. Lumon patio covers provide homeowners many benefits such as spending more time outside, an abundance of natural light and creates an entertainment space for your family and friends to enjoy. Find the right patio cover option for you! You don't have to be limited to one. We want to fulfill our mission of creating better homes for the community and families all over the world. 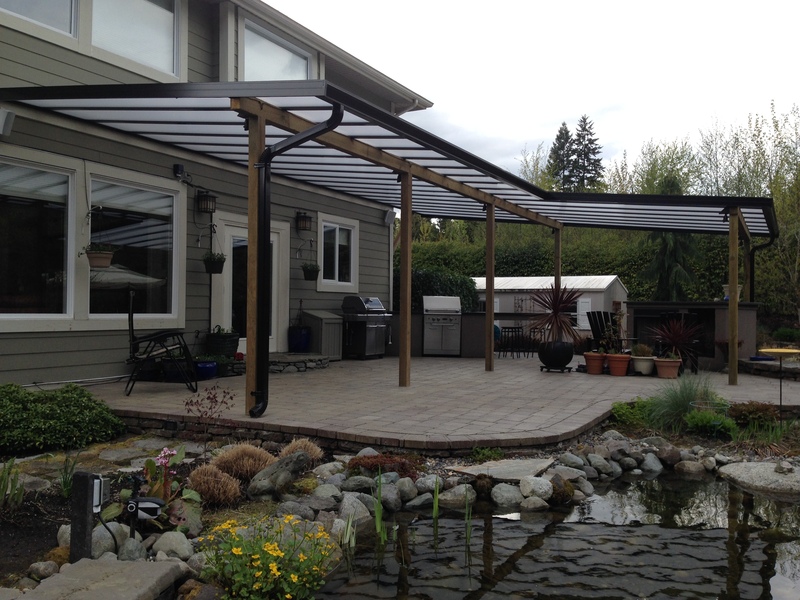 Installing a patio cover makes your patio more accessible throughout the year. Let Lumon help convert an ordinary outdoor space, into your ideal one. Who wouldn't want to have a stunning patio that will turn into the entertainment centre for your family and close friends season after season? Make your patio come to life and create memories on your backyard rain or shine! Browse through our gallery of our patio covers to gather some inspiration to get the ball rolling for your home.